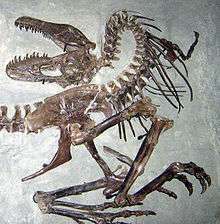 Dinosaur and bird fossils are frequently found in a characteristic posture consisting of head thrown back, tail extended, and mouth wide open. The cause of this posture—sometimes called a "death pose"—has been a matter of scientific debate. Traditional explanations ranged from strong ligaments in the animal's neck desiccating and contracting to draw the body into the pose, to water currents randomly arranging the remains in the position. 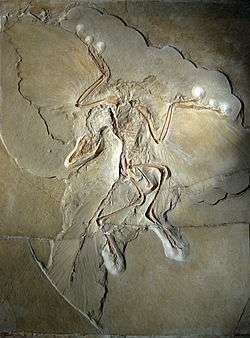 Faux and Padian suggested in 2007 that the live animal was suffering opisthotonus during its death throes, and that the pose is not the result of any post-mortem process at all. They also reject the idea of water as responsible for randomly arranging the bodies in a "death pose", as different parts of the body and the limbs can be in different directions, which they found unlikely to be the result of moving water. They also found that the claim that drying out of ligaments would make the position does not seem believable either. ↑ Padian K & Faux M (2007), "The opisthotonic posture of vertebrate skeletons: post-mortem contraction or death throes? ", Paleobiology 33(2): p. 201-226. ↑ Reisdorf, A.G. & Wuttke, M. (2012). 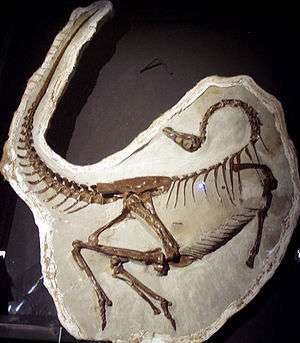 "Re-evaluating Moodie’s Opisthotonic-Posture Hypothesis in Fossil Vertebrates Part I: Reptiles—the taphonomy of the bipedal dinosaurs Compsognathus longipes and Juravenator starki from the Solnhofen Archipelago (Jurassic, Germany)". Palaeobiodiversity and Palaeoenvironments, 92(1): 119-168. doi:10.1007/s12549-011-0068-y.